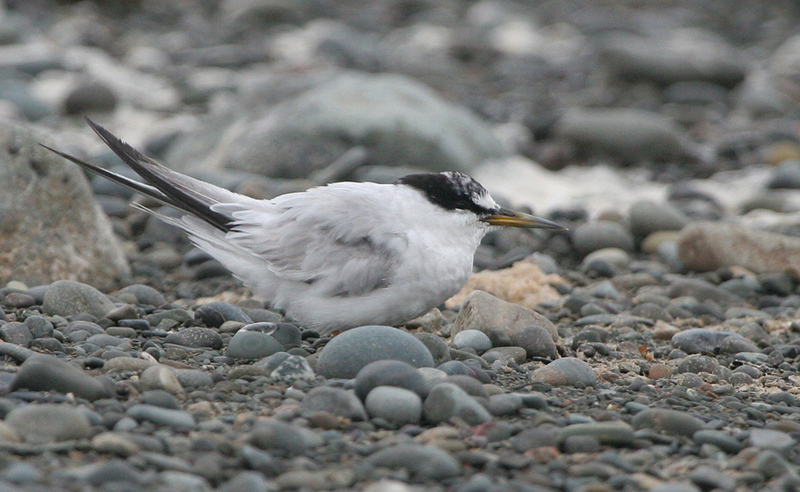 This Least Tern at St. Shott’s on September 16, 2006 was likely brought in by Hurricane Florence a few days earlier. Unfortunately, it didn’t hang around for several carloads of birders that raced out to see it! Origins: Breeds along the Atlantic coast of the Americas from Maine to Venezuela, as well as Bermuda and the Caribbean. It is closely related to the Little Tern in Europe. Record Details: Five records for Newfoundland: (1) Bear Cove (near Cappahayden), June 19, 1988; (2) Biscay Bay, July 15-17, 1994; (3) St. Shott’s, Sept 16, 2006 following Hurricane Florence; (4) Grand Bank-L’Anse aux Loup (Burin Peninsula), August 24, 2009 following Hurricane Bill; and (5) Near Cape Race, Sept 15, 2009. There is also one unconfirmed report of a specimen taken on September 10, 1867 (details lacking).